My building has a pool. This is a rare luxury for Brooklyn apartment buildings. When I moved into this building in 2009 I was happy that it had a pool but it was not the reason I took the apartment. I live in a rent stabilized building. When it was built in 1961 it would have been considered a luxury building. (pool, doorman, laundry) Most buildings like this have since been converted to co-ops but this one hasn't. I'm happy with the apartment, but the lobby is desolate due to a pipe blowing out at least a decade ago. They just recently took down scaffolding that had been up for at least four years. But the apartment is large, with a dishwasher (also unusual for NYC apartments), a doorman, laundry on the premises and yes - for two months out of the year - a swimming pool. Unfortunately there are some issues with the pool. 1) The Hours: The pool is only open Monday - Friday from 1:30 - 5:30 and on Sunday 11:00 - 3:30 and closed on Saturdays. Let me repeat that. CLOSED ON SATURDAYS. So basically if you have a job the pool isn't really for you. There is no possible way I could get home in time to swim during the week which only leaves a few hours on Sunday to enjoy the pool. 2) Can't bring friends or guests: I do kind of understand this one. It is a large building, and if everyone brought a guest it could be crowded. But it does kind of stink that if I have overnight guests I can't bring someone out to the pool for the few hours that it is open. 3) There is a $50 fee for the summer: Now I know that $50 doesn't sound like a lot of money to have use of a pool for the summer but consider the hours it's open. I would gladly pay this if the pool was open on Saturdays and until 8-9pm at least two days a week. 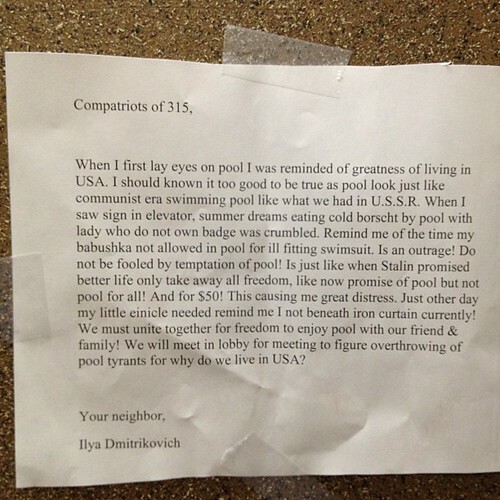 Ironically the fee for the pool is actually illegal. The pool is an amenity of the building, and it's against the law for theme to charge us for it. Just like the doorman and the laundry room, these amenities are covered in the rent. Furthermore the owners of the building would love to close the pool, but they can't because if they closed the pool, it would be a reduction of service and therefore, the tenants would be entitled to a rent reduction. There are tenants in this building who rented through brokers, and the brokers all used the pool as a "selling point". They were disenchanted when they learned of the "fee" and the limited hours. So some tenants were disappointed. But one disgruntled tenant decided to make their sentiments very clear by posting this sign on the elevator. I would love to join in this protest, but they didn't put a date and time for the meeting. I have a feeling that this sign will be taken down by morning. I love this sign!!! As for me, I went ahead and paid the $50, but I'm going to make darn sure I'm poolside every Sunday this summer. I figured it will cost me $6.25 for each swim. More if one of those days has thunder and lightening.